Crafton Hills College Foundation’s Garden Party Gala on March 28 brought in $125,000 thanks to the generous support of those who turned out for the affair. Proceeds during the non-formal event will support the Roadrunner community year-round through student scholarships and on-campus improvement projects, said event organizers. The gala is the nonprofit’s signature fundraiser and is held each year to not only raise much-needed dollars for the foundation but awareness of the group’s endeavors. Appetizers by Bon Appetít Management Company greeted guests as they arrived at the event held in Crafton Hall which was decked out in floral décor, from live plants and trees to designs on the gala’s official program. Guests were welcome to give right off the bat by backing several initiatives, from the purchase of textbooks and program materials, to funding student meals for a week. No donation was too small. Inside the venue, guests were treated to a catered dinner and a jam-packed program which featured remarks from Kevin Horan - Crafton’s new president – Riggs, and David Avila, the college’s Outstanding Alumni of the Year. “I’m never about trying to get this type of stuff. I’m very spiritual and God put me in this direction,” a humbled Avila said when it was his turn to speak before turning the focus back to the purpose of the gala. “I’m very proud of this (award) but at the same time we are all here doing what we should be doing – giving back to each other. “We are here because we want to help our students get ahead, be productive and at the end of the day come back” to support Crafton, he continued. 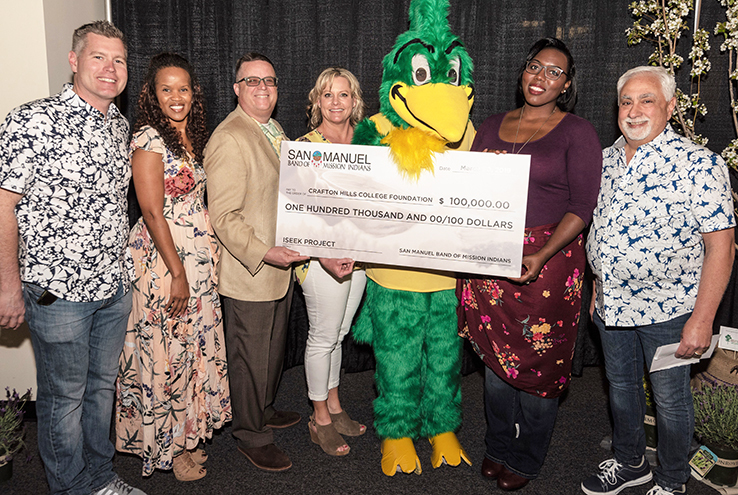 Additional event highlights included a check presentation by San Manuel Band of Mission Indians for $100,000 in support of the iSeek program which covers expenses associated with paid job opportunities for Crafton students, and a silent and live auction. The live auction brought in thousands by itself with guests scooping up a trip to Princeville on Kauai, Hawaii for $3,000 and a backyard putting green for $2,000. Before the program ended, gala organizers took time to reflect on the life of Betty Jo Wood, one of the foundation’s fiercest advocates. Wood died in January following a short battle with pancreatic cancer, and although she was not at the gala physically, her “feisty spirit was there with us,” Riggs said. Photos of the event can be found in the Roadrunner Scrapbook.